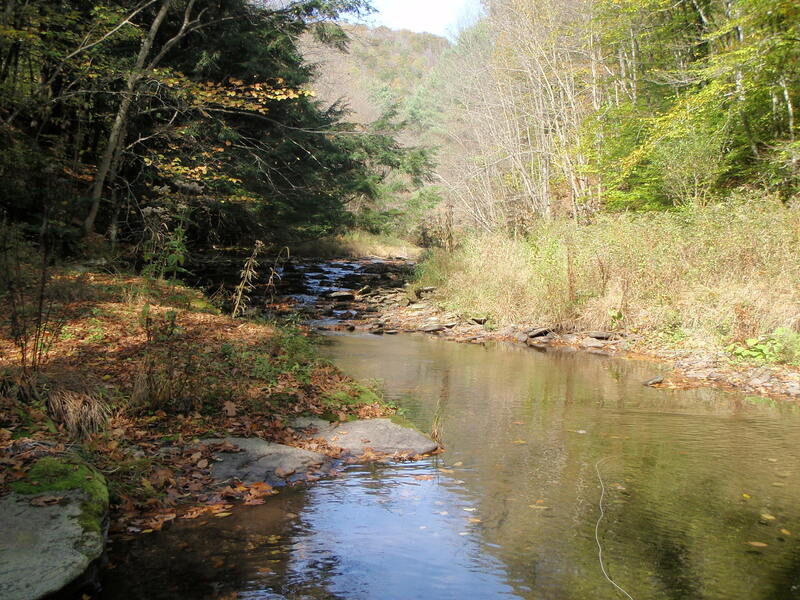 I began this walk at the Seven-Mile area of Slate and proceeded slowly toward the confluence of the Francis and Cushman branches, commonly acknowedged as the head of Slate Run proper. Here the gradient was lesser than downstream, but the wading still was tricky, requiring the angler to keep an eye on the rocks underfoot, on the humps of grass, the holes and the ledges. All the while, he had to keep the long leader with its pair of flies free of snags and any hook-ups that were not wild trout. Slate Run was low and clear, so low that the slightest misstep or the slightest splash of line and leader sent the quarry fleeing. Damnit, the fishing was tough, but not without its pleasure. 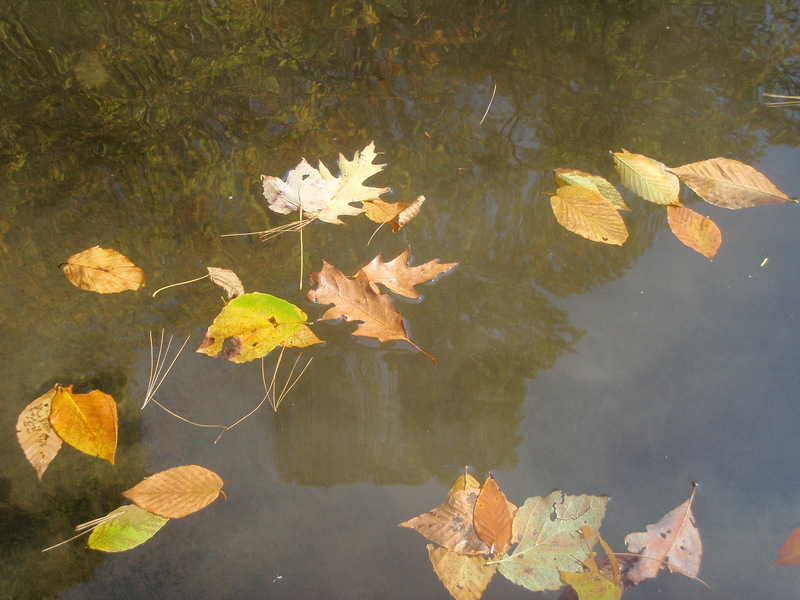 Autumn leaves fell in earnest across the skinny flow, gathering on the eddies and placid pools, hooking on the dry or wet fly all too often. 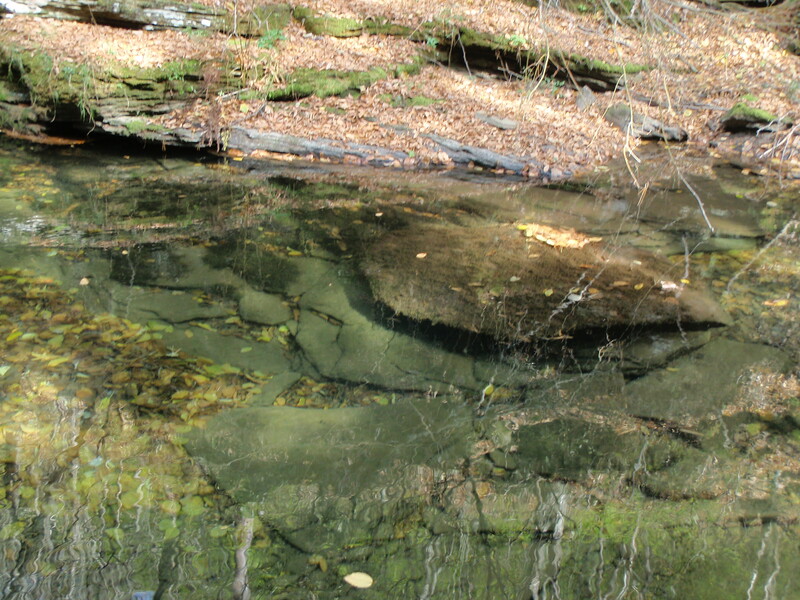 I maneuvered through the Devil’s Den cliff area and arrived at a lovely pool with sheltering rocks and boulders. I inched forward close to several brown trout that were possibly spawning. They were extremely wary and were having nothing to do with my careful presentations. The largest brown, about 14 or 15 inches, scurried to an overlying rock. It was good to see at least a few fish getting by up here. A wooded slope took its shape in front of me and I knew that Cushman Run would soon be entering from a northerly hollow and that Francis Branch would be entering to meet it from the left. Despite all physical evidence to the contrary, I do not believe that a small trout stream simply disappears as you approach its sources. Sure, the fishing ends inevitably, a sense of melancholy overcomes the angler as the flow gets thinner and evaporates, or maybe a feeling of jubilation settles in– hey, I did it! I accomplished a solid relationship with this stream; I got to know its curves and straightnesses, its depths and shallows, its fish and other lives! Either way, the hike, the fishing, ends, at least for the time being. But arriving at the headwaters is also more than termination or definitive conclusion. Getting here seems analogous to looking closely at the human heart. The organ is the source of blood in motion, blood that’s pumped throughout the body in an even and systematic flow. The blood returns to the heart, to be pumped again and again. The organ, like the source of a wild trout fishery, is vital. Slate Run begins at the Francis-Cushman Hole and flows dynamically for seven-plus miles to the big Pine Creek. 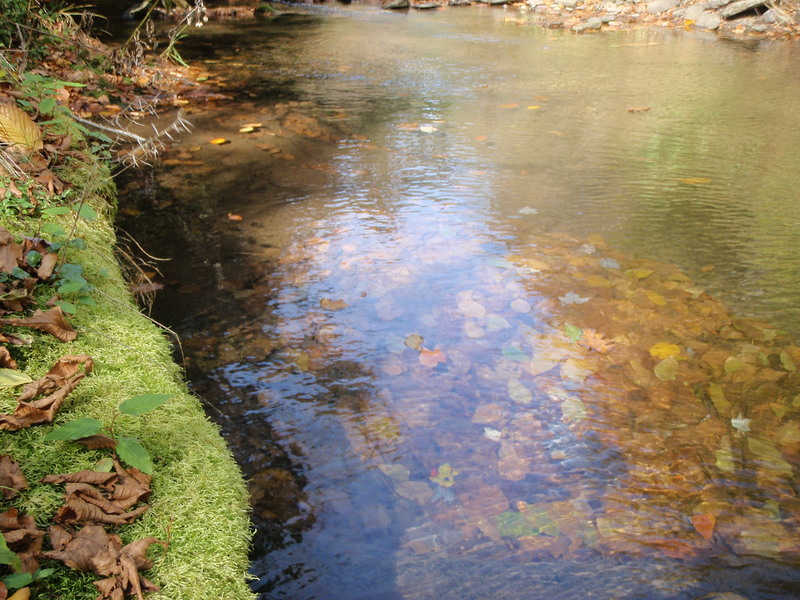 Those downstream waters will eventually evaporate and return in some form to the high forests of this watershed. 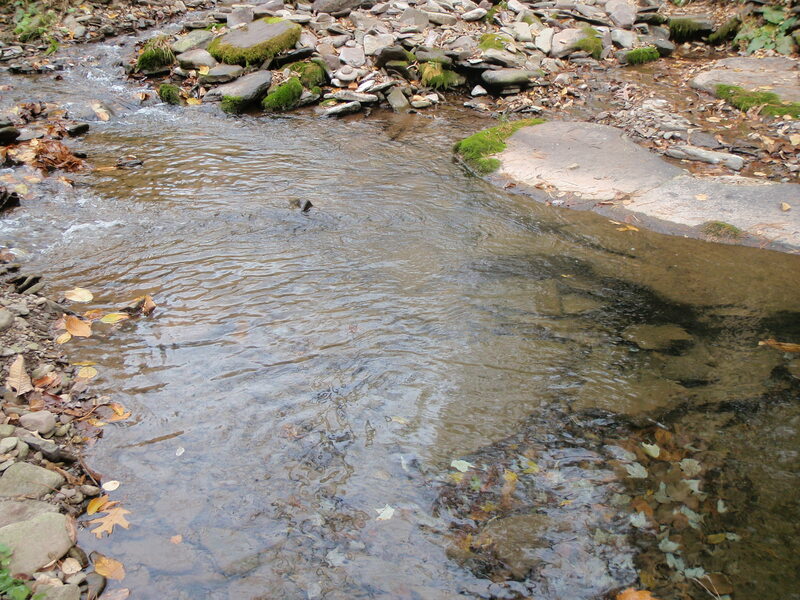 In fact, even today, under drought conditions, two small streams come together from the hills beyond and form Slate Run. Next spring I’ll try to work my way up Cushman Run, cross the Bear Run Road and fish my way into Apple Tree Hollow as far as I can go and still drop a fly for trout. That’s what I envisioned doing when I set out on my “odyssey” a year ago September. 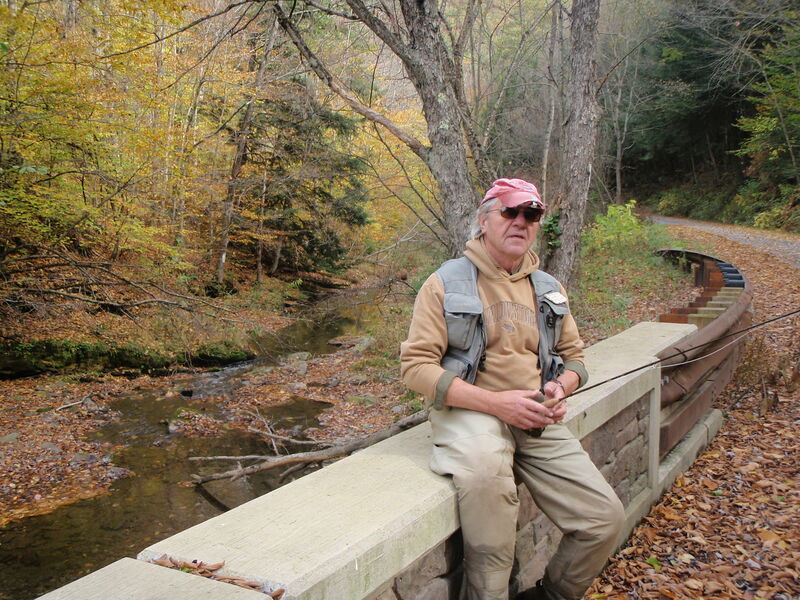 I’ll seek the highest brook trout in the Slate Run watershed, not because I’m “OCD, obsessive-compulsive,” as some might say (or crazy, as others might suggest convincingly), but because there’s always more to learn about a watershed, there’s always another closet of the soul to peek inside of. 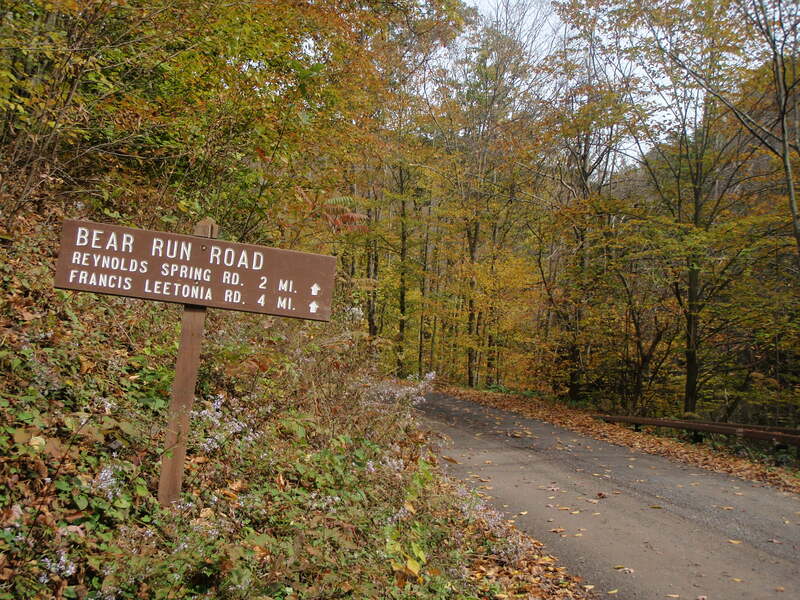 The Slate Run Odyssey came to a finish on October 13, 2012. I looked forward to a possible series I’d be writing next year called “Beyond Slate Run.” Its posts could include adventures found among the headwaters. Hopefully by then the water flow will be decent and the trout population healthy. The Apple Tree Run was two or three miles away from me at this “finish line” and, given enough water, could be very promising in May or June. We’ll see. My wife took a picture of me sitting on a little bridge near the confluence of the branches. I look at the photo of the old guy there and think, “he doesn’t look as though he’s celebrating.” He shouldn’t be; it’s really no big deal. And yet, as I opened up the trunk lid of the car, there was one thing I did before untying my wading shoes and throwing off my vest. I uncapped a Southern Tier IPA (my brew of choice these days) that I’d brought along for the occasion. No fanfare, just a quick slug for the stream I’ve come to know. This entry was posted in Uncategorized and tagged beyond Slate Run, Cushman Branch, Francis Branch, heart, low water, Slate Run source, spawning browns. Bookmark the permalink. If only the brew of choice had been included in the picture of the old guy sitting there…then the word “quintessential” might have come to mind. Congratulations on seeing a scenic and epic project through to the end! Junior, I’m gettin’ senile! Why the hell didn’t I think of that? It’s a no-brainer, should’ve had the bottle in hand. Thanks! Scott Cornett left the following comment on my email, which I’d like to include here, along with a brief response: “I have been enjoying your Slate Run journeys on the blog! You picked a hell of a tough season to catch fish there though…” Scott, I cannot recall a more difficult late-summer/early fall season on the local freestones (like Slate and Cedar) than this past one. Not in my 25 years of keeping track! Glad that you were able to come along. Thanks for reading! Coty, I may try to do the same. Am itching to return.